Mitchell Gallery Exhibition Schedule 2006-2007. Exhibitions include: Living with Art: Early American Modernism from the Baker/Pisano Collection of the Heckscher Museum of Art; Joan Miro: Illustrated Books; Graphics by 20th Century Masters from the Cochran Collection; Richard Jolley: Sculptor of Glass from 1985 to the Present; and St. John's College Community Art Exhibition. 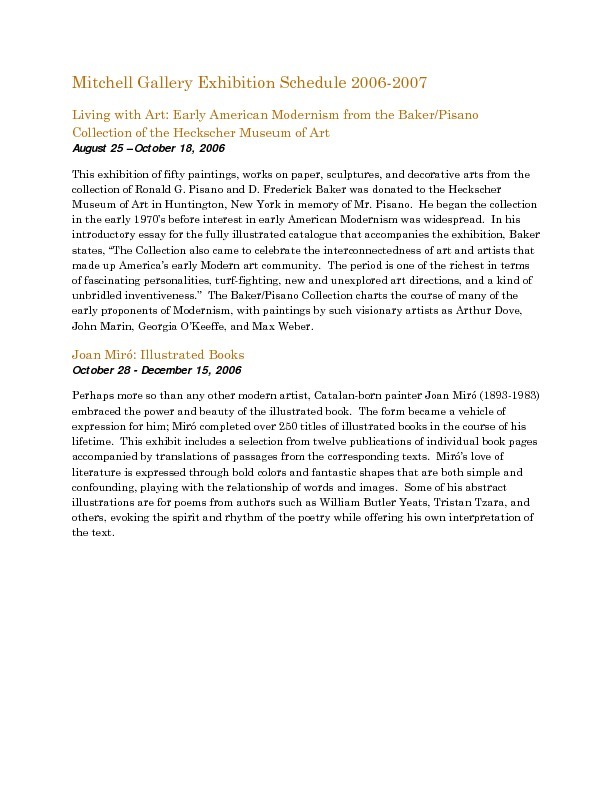 Mitchell Art Gallery, “Mitchell Gallery Exhibition Schedule 2006-2007,” St. John's College Digital Archives, accessed April 21, 2019, http://digitalarchives.sjc.edu/items/show/2704.